A reader sent me a link to the website of a family named McClung in Mesa, Arizona. It seems these folks bought a house with an empty and derelict swimming pool in the backyard. 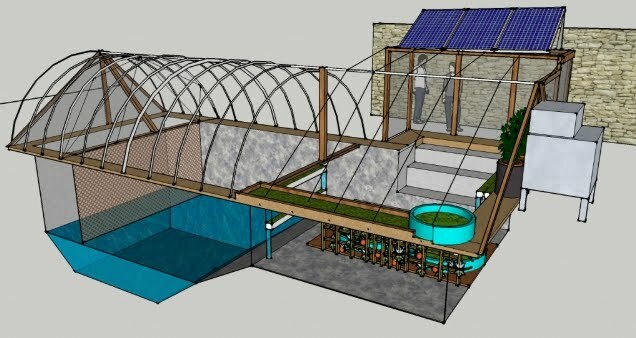 Rather than go through the expense of either repairing or dirt-filling the pool, the McClungs got the idea to utilize the existing space and turn it into an urban greenhouse. What followed is an amazing journey toward urban homesteading and increased self-sufficiency. "Initially, we had anticipated self-sufficiency by 2012," the McClungs write on their website, "but we achieved our goal by mid-2010. 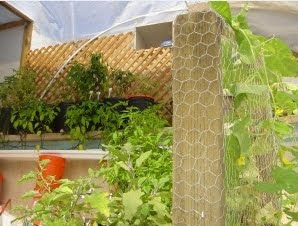 Our family gets about 8 fresh eggs a day, unlimited tilapia fish, organic fruit, veggies, and herbs 365 days a year. To our knowledge, the GP (short for Garden Pool) is a one of a kind creation." I was so impressed by what they've accomplished that I emailed and asked permission to lift some photos from their website. 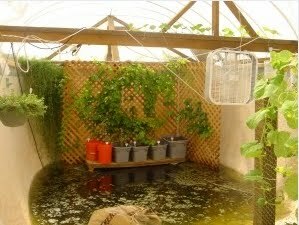 They raise fish in the deepest part of the pool, and utilize hydroponics to grow weed-free fruits and vegetables in other parts. They even raise their own fishfood and chickenfeed. 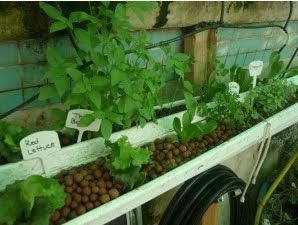 My hat is off to this family for their clever and resourceful use of space, as well as their willingness to teach others about aquaculture and hydroponics. Go check out their website - it's got tons of info! Maybe they should trademark "garden pool." Heh. Never mind. I see they made the same joke first. Awesome! I love to see integrated systems like this. Jsut plain old fashioned smart use of resources - - and CLEVER. That's interesting, especially considering that an unfilled in-ground pool is supposed to be subject to implosion. I guess that isn't necessarily so afterall. I certainly admire their ingenuity and their hard work. They got it going on. Kudos to them! i just love it when someone thinks outta the box and takes a chance. My wifes father moved-retired to the South Carolina coast many years ago. When were prepping his lot they found the basement foundation of an old Tammy ruin in the front yard. Rather then leveling it, he had them dig it out, and made a scenic garden out of it. He put a drip system in to keep the plants wet. It has a little bit of the look of a pool, except that there are steps going down to it. Tammy is an old type of concrete made from oyster shells. It has a rough appearance and you can see the shells in it, but it works well. I checked out their site and see they're giving classes. Good! This is really inspiring to see. I think the implosion you are thinking of may be a concern in other types of soil and water tables, but not most of Arizona. There's no groundwater to be concerned with anywhere near the surface and the "soil" is hard as rock. (Because a lot of it IS rock! )Someone correct me if I'm wrong. Jeff, you are probably correct. I don't know the details, just the hearsay. 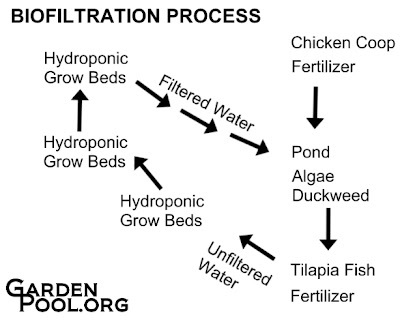 There is one thing I know with a certainty, though - the pool converted to fish pond is a very practical idea and if I had my way I'd be raising trout in the backyard instead of weeds. It's fantastic whenever people get innovative and creative and learn to take care of themselves without hurting others. BRAVO!!! what a great bit of can do spirit and some serious thriftiness going on there! I just love it. Look in the surround photo , way in the back in the A frame type area is where they stash the chickens. I wonder how they handle the heat from the greenhouse in Arizona ? No, they say that the chickens live ABOVE the pond. So the poop falls down and the fishes eat it. Is that wild or what? Tina, they said they have a swamp cooler and fans and that the ambient temperature in the structure is 15-20 degrees cooler than outside. The only thing about hydroponics is that electricity is needed. I am sure it can be done without electricity but I have not had the time to look into it yet.